Together with Las Vegas, Atlantic City casinos have nowadays become one of the most popular attractions for world's gamblers, wishing to absorb into the live casino charming atmosphere and enjoy playing versatile games. Nevertheless, the city has faced a great deal more intricacies and hurdles within its history, if compared to "the elder brother". Having officially been founded in the 19th century, Atlantic City, New Jersey, at first has faced stages of rapid developed, mostly connected with the construction of railroad and real estate building. Still, the prosperous times didn't even last a century, and after World War II, the city almost went bankrupt, some of its parts being totally impoverished. The economic collapse was obvious, but, unfortunately, neither of Atlantic City mayors, or the state's governors had succeeded in changing the situation to better by the 1970's. The year of 1976, when gambling was legally approved by the city's authorities, has become a starting point of the brand-new chapter, and the new one global casino center was born, the very first casino having been opened in Chalfonte-Haddon Hall Hotel. As for the 2000's, Atlantic City casinos industry has encountered new problems, as the gambling city was no longer as attractive, as renovated Las Vegas casinos. Therefore, the casino owners' as well as the mayor cabinet's efforts have been put into the development of new road roots and unique luxurious resorts, which would draw the players' attention back. Fortunately, those efforts turned out unbelievably successful, and along with the appearance of the new members of the casino grandee families on the territory of the city, it has again become flourishing. Modern Atlantic City casinos are impressive in the architecture of their hotel & casino resorts with the unbelievable amount of beneficial services, offered to their clients. In the most famous MGM Resorts and Trump casinos the gambling process never stops, as all the playing areas tend to work 24/7, the only exception being July 5, 2006, when the city's budget failed to be presented, and the casinos were shut down, but that halt hasn't lasted for more, than half a day. In addition to first-class resorts, being uniquely-designed in order to stun the pickiest visitors, Atlantic City is also prominent for its incredible boardwalks, laid on the foundation of steel and concrete, the Ventnor boardwalk, in particular, being almost 10 km long. 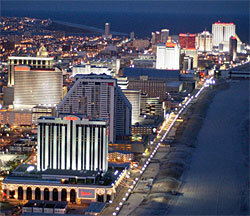 All things considered, even though Atlantic City casinos have recently been failing in attracting more average tourists and gamblers, much because of the smoking ban in 75% of casinos and the general drop in the US economy, the city's truly worth visiting at least for once, as it has managed to preserve its special charm.